I’m way overdue sharing my latest knitting FO. I finished it right on the dot on August 31. I really was hoping to finish them by the end of August and I made it! 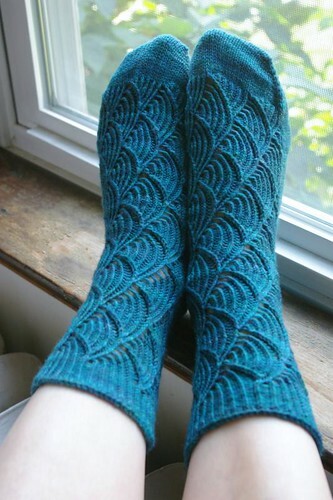 It took me just over 11 months to finish these socks, but I did it. The Pomatomus are done! These socks were a fun knit. The pattern isn’t incredibly complicated and became fairly mindless towards the end. Of course, I made changes to the pattern. I knit them toe up and put in a short row heel. I think it would have been cool to reverse the pattern on the second sock but I don’t mind that both socks are identical. Maybe for the next pair of Poms? I used the lovely Dream in Color Smooshy in Blue Lagoon and I love how the color works with the pattern. I haven’t gotten around to wearing them yet but the chilly days have started again and I’m wearing wool socks every day already so they’ll soon get their turn. I finished as well the set of box bags to head out to the Vermont Sheep and Wool Festival. I’m quite happy with the assortment of colors and prints. I hope they’ll all find new homes during the festival. If you’re in the area and are planning to go, make sure to stop by the yarn4socks booth and say hello! Now I should really get back to the other batch that’s on my sewing table right now! ooooh your box bags are gorgeous! I am sure they will sell like hot cakes! The striped bag is gorgeous! I’m sure they’ll all find good homes. beautiful blue pamotomus’s! (or however one pluralize that word!) I really wish I could go to the VT sheep and wool, but you know I’ll be at rhinebeck! I think I need one of those large-sized bags here…..
Beautiful poms! So far, my poms are the only pair of socks I’ve made. I really enjoyed the pattern. Great box bags too. Oh, I signed up for a beginning quilting class yesterday. It starts on the 30th. I’m excited! Your bags look great and I’m sure they’ll be a great success! Will you be at Stitches East in October? Those socks are gorgeous! I’m coveting them. Where did you get the labels on your box bags? I need to get some of my own.